Cuts through grease. No. 1 world's recommended brand. 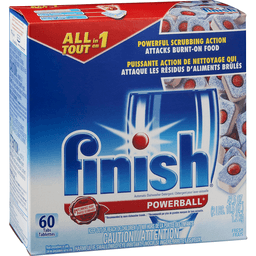 Recommended by more dishwasher brands worldwide (More dishwasher brands recommend Finish products worldwide than any other brand). Our Powerball supercharges the table which cuts through even the toughest grease for a deep clean. Discover our product range for amazing cleaning results. All in 1: no need to pre-soak; powerful cleaning; cuts through grease; prevents re-deposits; attacks burnt-on food; scrubs away dried-on leftovers; removes tea and coffee stains; no need to pre-rinse. Save your water! Scrape the dishes instead of pre-rinsing them and save up to 20 gallons of water for every full load. www.happier-homes.com. Contains less than 0.5% phosphorus by weight. 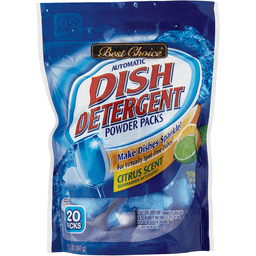 Finish detergent tablets are safe for septic systems. Settling of tabs may occur in shipment. Only use dishwasher safe items in your dishwasher. Health. Hygiene. Home. Questions? 1-800-228-4722. For ingredient and other information, www.finishdishwashing.com. Box Tops for Education. Contains recyclable where recycling facilities exist. Made in USA. 15X power (Compare Cascade's product power). Tougher than burnt-on messes. No pre-wash. Dawn grease fighting power. No. 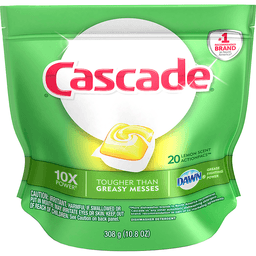 1 recommended brand in North America (More dishwasher brands in North America recommend Cascade vs. any other automatic dishwashing detergent brand; recommendation as part of co-marketing agreements). Safe for septic tanks. www.pg.com. Questions? 1-800-765-5516. www.cascadeclean.com. Phosphate free. Toughness Comparison: Compare Cascade's Product Power: Cascade Platinum: Best overall cleaning power; Best of powder & gel; Best grease fighting power of Dawn; Powers away tea stains best; Powers away residues best; Best brilliant shine; Best glass protection; Best quick dissolving; Best - No pre-wash needed; Best easy dosing; Cleans 24 hour stuck-on food best; Cleans baked-on food best; Best - Tough on burnt-on messes; Best sparkling clean silverware; Best helps keep dishwasher sparkling. Our triple chamber pac is tough enough to tackle even your burnt-on messes without pre-washing. Smartlabel. Good Housekeeping: Since 1909. Quality tested. Limited warranty to consumers. ghseal.com for details. 12x power (Compare Cascade's product power). Tougher than stuck-on messes. Dawn grease fighting power. No. 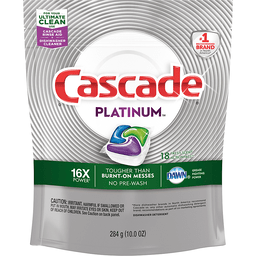 1 recommended brand in North America (More dishwasher brands in North America recommend Cascade vs. any other automatic dishwashing detergent brand; recommendation as part of co-marketing agreements). Our dual chamber pac is formulated with more tough food cleaning ingredients (vs. regular Cascade Action Pacs) so you don't need to pre-wash. KitchenAid. Maytag. Whirlpool. GE appliances. Samsung. Toughness Comparison: Complete: 12x: better overall cleaning power; best of powder & gel; grease fighting power of Dawn; powers away tea stains; powers away residues; brilliant shine; glass protection; quick dissolving; no pre-wash needed; easy dosing; cleans 24 hour stuck-on food; cleans baked-on food. Safe for septic tanks. Phosphate free. Questions? 1-800-765-5516. www.cascadeclean.com. www.pg.com. Good Housekeeping: Since 1909. Quality test. Limited warranty. ghseal.com for details. SmartLabel. 15X power (Compare Cascade's product power). Tougher than burnt-on messes. No pre-wash. Dawn grease fighting power. No. 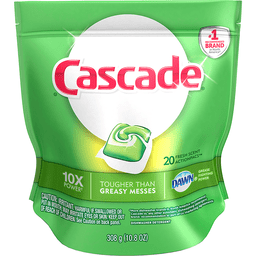 1 recommended brand in North America (More dishwasher brands in North America recommend Cascade vs. any other automatic dishwashing detergent brand; recommendation as part of co-marketing agreements). Phosphate free. Safe for septic tanks. www.pg.com. Questions? 1-800-765-5516. www.cascadeclean.com. Toughness Comparison: Compare Cascade's Product Power: Platinum: best overall cleaning power; best of powder & gel; grease fighting power of Dawn; powers away tea stains; powers away residues; brilliant shine; glass protection; quick dissolving; no pre-wash needed; easy dosing; cleans 24 hour stuck-on food; cleans baked-on food; tough on burnt-on messes; sparkling clean silverware; helps keep dishwasher sparkling. Our triple chamber pac is tough enough to tackle even your burnt-on messes without pre-washing. KitchenAid. Maytag. Whirlpool Home Appliances. GE Appliances. Samsung. Good Housekeeping: Since 1909. Quality tested. Limited warranty. ghseal.com for details. Smartlabel. 12X power (Compare Cascade's product power). Tougher than stuck-on messes. Dawn grease fighting power. No. 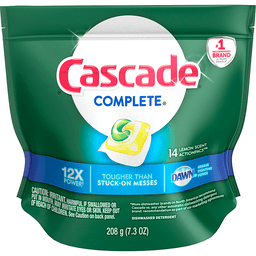 1 recommended brand in North America (More dishwasher brands in North America recommend Cascade vs. any other automatic dishwashing detergent brand; recommendation as part of co-marketing agreements). Our dual chamber pac is formulated with more tough food cleaning ingredients (vs. regular Cascade Action Pacs) so you don't need to pre-wash. KitchenAid. Maytag. Whirlpool Home Appliances. GE Appliances. Samsung. Toughness Comparison: Compare Cascade's Product Power: Complete 12X: Better overall cleaning power; best of powder & gel; grease fighting power of Dawn; powers away tea stains; powers away residues; brilliant shine; glass protection; quick dissolving; no pre-wash needed; easy dosing; cleans 24 hour stuck-on food; cleans baked-on food. Safe for septic tanks. Good Housekeeping: Since 1909. Quality tested. Limited warranty. ghseal.com for details. Phosphate free. Questions? 1-800-765-5516. www.cascadeclean.com. www.pg.com. Smartlabel. 15X power (Compare Cascade's product power). Tougher than burnt-on messes. No pre-wash. Dawn grease fighting power. No. 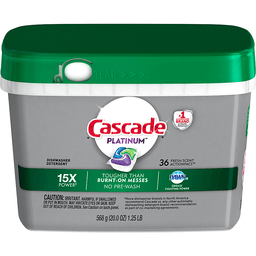 1 recommended brand in North America (More dishwasher brands in North America recommended Cascade vs. any other automatic dishwashing detergent brand; recommendation as part of co-marketing agreements). Our triple chamber Action Pac is tough enough to tackle even your burnt-on messes without pre-washing. KitchenAid. Maytag. Whirlpool. GE Appliances. Samsung. Toughness Comparison: Compare Cascade's Product Power: Cascade Platinum: Best overall cleaning power; Best of powder & gel; Best grease fighting power of Dawn; Powers away tea stains best; Powers away residues best; Best brilliant shine; Best glass protection; Best quick dissolving; Best - No pre-wash needed; Best easy dosing; Cleans 24 hour stuck-on food best; Cleans baked-on food best; Best - Tough on burnt-on messes; Best sparkling clean silverware; Best helps keep dishwasher sparkling. Safe for septic tanks. Phosphate free. Questions? 1-800-765-5516. www.cascadeclean.com. www.pg.com. Smartlabel. Good Housekeeping: Since 1909. Quality tested. Limited warranty. ghseal.com for details. 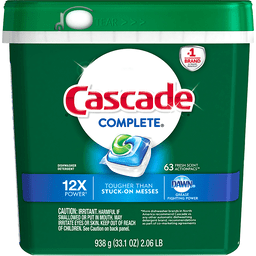 Cascade® Complete® Dishwasher Detergent Fresh Scent. #1 Recommended brand in North America*. Actionpacs™. 12x Power†. Tougher than stuck-on messes. Dawn® grease fighting power. 938 g (33.1 oz) 2.06 lb. Our dual chamber pac is formulated with more tough food cleaning ingredients** so you don't need to pre-wash. Toughness Comparison: Actionpacs: Overall cleaning power - 10x Good. Best of powder & gel. Grease fighting power of dawn®. Powers away tea stains. Powers away residues. Brilliant shine. Glass protection. Quick dissolving. No pre-wash needed. Easy dosing. Complete: Overall cleaning power - 12x Better. Best of powder & gel. Grease fighting power of dawn®. Powers away tea stains. Powers away residues. Brilliant shine. Glass protection. Quick dissolving. No pre-wash needed. Easy dosing. Cleans 24 hour stuck-on food. Cleans baked-on food. Platinum: Overall cleaning power - 15x Best. Best of powder & gel. Grease fighting power of dawn®. Powers away tea stains. Powers away residues. Brilliant shine. Glass protection. Quick dissolving. No pre-wash needed. Easy dosing. Cleans 24 hour stuck-on food. Cleans baked-on food. Tough on burnt-on messes. Sparkling clean silverware. Helps keep dishwasher sparkling. #1 Recommended brand in North America*: KitchenAid®. Maytag®. Whirlpool®. GE Appliances. Samsung. Phosphate free. Safe for septic tanks. 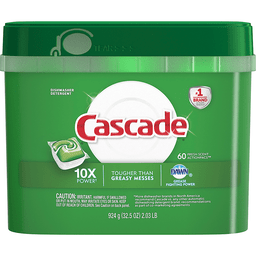 †Compare cascade's product power *More dishwasher brands in North America recommend Cascade vs. any other automatic dishwashing detergent brand; recommendations as part of co-marketing agreements. **vs. Regular Cascade ActionPacs. Whirlpool, KitchenAid and Maytag are registered trademarks of Whirlpool, U.S.A., KitchenAid, U.S.A., or Maytag Properties, LLC or its related companies. Patents: www.pg.com/patents. Questions Call: 1-800-765-5516. Visit: www.cascadeclean.com, www.pg.com. © 2016 P&G. Dawn grease fighting power. Powers away greasy residue for sparkling dishes. 6x power (Compare Cascade's product power). Phosphate free. Cascade ActionPacs contain water softening agents to help prevent materials in hard water from settling on your dishes, causing film. Safe for septic tanks. Questions? 1-800-765-5516. www.cascadeclean.com. No. 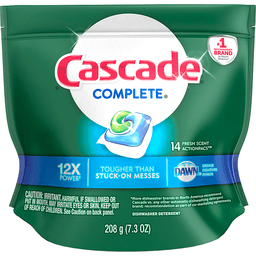 1 recommended brand in North America (More dishwasher brands in North America recommend Cascade vs. any other automatic dishwashing detergent brand, recommendations as part of co-marketing agreements). KitchenAid. Maytag. Whirlpool Home Appliances. GE appliances. Good Housekeeping: Since 1909. Limited warranty to consumers. Replacement or refund if defective. Overall cleaning power; best of powder and gel combined; grease fighting power of Dawn; powers away tea and coffee stains; powers away residues; brilliant shine. Made in USA. 16X power (Compare Cascade's product power). Tougher than burnt-on messes. No pre-wash. Dawn grease fighting power. New! Our toughest got tougher! No. 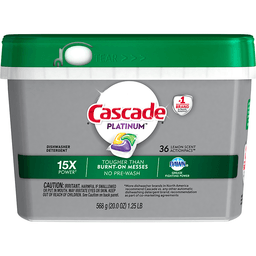 1 recommended brand in North America (More dishwasher brands in North America recommended Cascade vs. any other automatic dishwashing detergent brand; recommendations as part of co-marketing agreements). Your ultimate clean. Platinum Action Pac: Tackle tough messes + Rinse Aid: Reduce spots & streaks + Dishwasher Clean: Keep your machine sparkling. 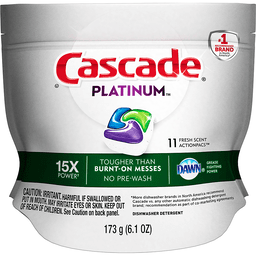 Toughness Comparison: Compare Cascade's Product Power: Platinum 16X: best overall cleaning power; best of powder & gel; grease fighting power of Dawn; powers away tea stains; powers away residues; brilliant shine; glass protection; quick dissolving; no pre-wash needed; easy dosing; cleans 24 hour stuck-on food; cleans baked-on food; tough on burnt-on messes; sparkling clean silverware; helps keep dishwasher sparkling; best on dishwasher safe pots & pans. KitchenAid. Maytag. Whirlpool Home Appliances. Samsung. Kenmore. Frigidaire. Electrolux. Good Housekeeping: Since 1909. Quality tested. Limited warranty. ghseal.com for details. Questions? 1-800-765-5516. www.cascadeclean.com. SmartLabel: Scan with SmartLabel app for more info. Phosphate free. Safe for septic tanks. 10X power (Compare Cascade's product power). Tougher than greasy messes. Dawn grease fighting power. No. 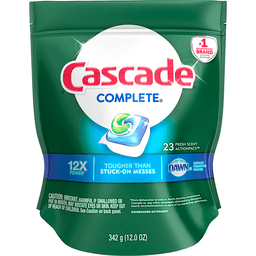 1 recommended brand in North America (More dishwasher brands in North America recommend Cascade vs. any other automatic dishwashing detergent brand; recommendation as part of co-marketing agreements). Dependable Cascade Clean with the grease fighting power of Dawn. Toughness Comparison: Compare Cascade's Product Power: Action Pacs 10X: good overall cleaning power; best of powder & gel; grease fighting power of Dawn; powers away tea stains; powers away residues; brilliant shine; glass protection; quick dissolving; no pre-wash needed; easy dosing. KitchenAid. Maytag. Whirlpool Home Appliances. GE Appliances. Samsung. Safe for septic tanks. Good Housekeeping: Since 1909. Quality tested. Limited warranty. ghseal.com for details. Phosphate free. Questions? 1-800-765-5516. www.cascadeclean.com. Smartlabel. 10X power (Compare Cascade's product power). Tougher than greasy messes. Dawn grease fighting power. No. 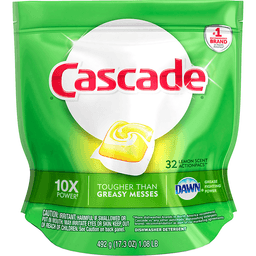 1 recommended brand in North America (More dishwasher brands in North America recommend Cascade vs. any other automatic dishwashing detergent brand; recommendation as part of co-marketing agreements). Dependable Cascade clean with the grease fighting power of Dawn. KitchenAid. Maytag. Whirlpool Home Appliances. GE Appliances. Samsung. Toughness Comparison: Compare Cascade's Product Power: Action Pacs: good overall cleaning power; best of powder & gel; grease fighting power of Dawn; powers away tea stains; powers away residues; brilliant shine; glass protection; quick dissolving; no pre-wash needed; easy dosing. Safe for septic tanks. Good Housekeeping: Since 1909. Quality tested. Limited warranty. ghseal.com for details. Phosphate free. Questions? 1-800-765-5516. www.cascadeclean.com. www.pg.com. Smartlabel. 15X power (Compare Cascade's product power). Tougher than burnt-on messes. No pre-wash. Dawn grease fighting power. No. 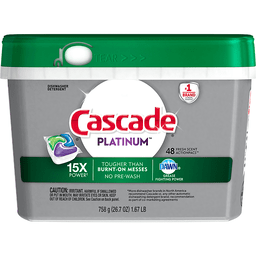 1 recommended brand in North America (More dishwasher brands in North America recommended Cascade vs. any other automatic dishwashing detergent brand; recommendation as part of co-marketing agreements). Our triple chamber pac is tough enough to tackle even your burnt-on messes without pre-washing. Phosphate free. Safe for septic tanks. www.pg.com. Questions? 1-800-765-5516. www.cascadeclean.com. Toughness Comparison: Compare Cascade's Product Power: Platinum 15X: Best overall cleaning power; Best of powder & gel; Best grease fighting power of Dawn; Powers away tea stains best; Powers away residues best; Best brilliant shine; Best glass protection; Best quick dissolving; Best - No pre-wash needed; Best easy dosing; Cleans 24 hour stuck-on food best; Cleans baked-on food best; Best tough on burnt-on messes; Best - Sparkling clean silverware; Best - Helps keep dishwasher sparkling. KitchenAid. Maytag. Whirlpool Home Appliances. GE Appliances. Samsung. Good Housekeeping: Since 1909. Quality tested. Limited warranty. ghseal.com for details. Smartlabel. 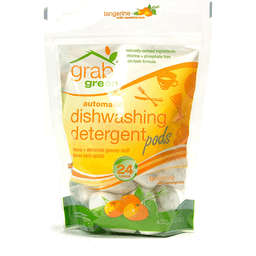 Grab Green® Automatic Dishwashing Detergent Pods Tangerine With Lemongrass. Naturally-derived ingredients. Non-toxic formula. Super cleaning. Powerful grease removal. Brilliant shine. 24 Loads. Formulated for standard machine and elegant European model. 432 g (15.2 oz). 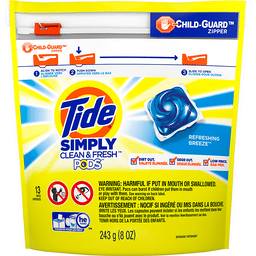 Highly concentrated dishwashing detergent pods. Free of phosphates. No chlorine or dyes. True transparency: We want you to know what's inside and why! Sodium citrate - cleans. Sodium carbonate peroxide - cleans & removes greasy stuff. Sodium sulfate - absorbs excess water. Sodium carbonate - water softener. Sodium silicate - cleans. Linear alcohol ethoxylate - cleans. Tetrasodium iminodisuccinate - removes calcium & other minerals from water. Hydrated silica - anti-caking. Sodium polyaspartate - prevents food from resticking. Fragrance - contains a blend of tangerine, lemongrass and bergamot essential oils and safer man-made ingredients to ensure a consistent scent. Alpha-amylase enzyme blend - removes starches. Protease enzyme blend (subtilisin) - removes grease and proteins. Polyvinyl alcohol - forms the pod. No animal testing. Grab Green® has a complete collection of naturally-derived home cleaning products. Please recycle. Questions or Comments Call at 888-841-GRAB (4722). www.grabgreenhome.com. ©2015 Maddiebrit Products, LLC.